When Betelhem Dessie’s father didn’t have time to celebrate her 9th birthday, she decided to become a tech entrepreneur and pay for a celebration herself. Drawn to the field for its money-making potential, Betelhem began learning by hanging around local computer repair and video editing shops in her Ethiopian hometown of Harar. Google searches and borrowed books from local colleges helped expand her knowledge. Soon Betelhem was earning an income from her after-school tech jobs, which included video editing and installing cellphone software. “Being able to make that money made me feel very confident and independent. I wanted that feeling to last,” she explains of her initial interest in the field. It turned out that Betelhem had a natural — even prodigious — talent for technology and coding. As her capabilities grew, so did her fame. Local news outlets began featuring Betelhem’s story. When she was 10 years old, then Prime Minister of Ethiopia Meles Zenawi invited her and her family to live in the capital of Addis Ababa. The government paid for Betelhem to continue her education and to work on confidential software development projects. Since then, Betelhem has been busy putting her skills to use — she has developed and copyrighted four software programmes, including a digital library that she created in grade 10. The programme helps schools with limited internet to access the resources their students need to learn. Betelhem also invented an app that allows the government to track irrigation systems by mapping rivers. Any agricultural professional with a smartphone can contribute to the app. The fast-growing Ethiopian tech industry has earned Addis Ababa the nickname, “Sheba Valley.” Betelhem believes that the government’s recent reforms — which include privatising large state-owned companies — are helping to encourage investment. “There’s a huge market. Investors are interested in that huge market. And there’s also a lot of people that are young who you can train either for outsourcing projects or projects that you can do for the local community,” she explains. Betelhem wants to equip the next generation of Ethiopians with the skills they need to take advantage of these opportunities. With Girls Can Code, an initiative by U.S. Embassy, Betelhem taught young women how to build websites and apps. “It inspired me to learn and to do more,” Betelhem says of the experience. 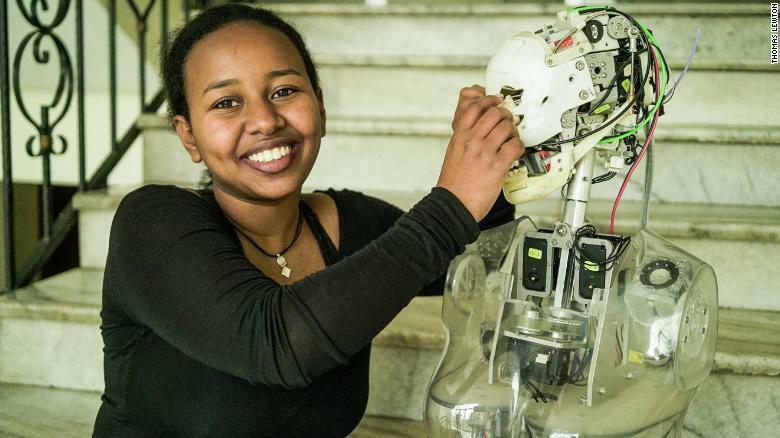 Now as a project manager at iCog Labs — the first artificial intelligence (AI) lab in Ethiopia — Betelhem works on several projects to increase girls’ participation in the field. With the Solve IT programme, Betelhem travels around the country to help young people ages 18 to 28 create tech-based solutions to their communities’ problems. “We have seen a lot of great innovations,” Betelhem says of the initiative, which the U.S. Embassy and the Japan International Cooperation Agency (JICA) sponsor. Past Solve IT projects include self-driving farming tractors, a device that changes the waste from cooking injera (a type of flatbread) into electricity and an oxygen therapy device for premature babies. Betelhem is particularly proud of her work with iCog’s Anyone Can Code programme, aimed at children ages 8 to 18. Through after-school programmes and summer camps, Betelhem and her colleagues teach students the basics of coding and robotics. Exacerbating the issue is the fact that technology and coding classes aren’t a priority in Ethiopian schools. “The awareness that people have regarding the tech education is: ‘Unless you want to be a computer scientist, coding is not really necessary,’ which is not true,” Betelhem laments. “Coding is a necessary skill in order to understand robots and such. When we live with these machines, I think it is important to understand them.” Betelhem is currently working on Anyone Can Code toolkits and resources to distribute to other parts of the country so that her trainings can reach an even wider audience. “The plan is to do a bus with computers but also including 3D printers, robots and such,” she shares. “And then we go to every city to give one hundred hours of coding to anyone who’s interested to participate.” Betelhem believes the Sophia brand name will help generate enthusiasm about the initiative. This piece is available in Arabic, French and Spanish﻿.